Please review the UPDATE to this post, originally published on 04/07/2012, below in Orange. 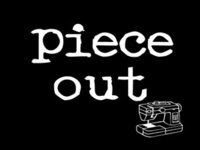 It's time to say, 'Piece Out' to our Piece Out Logo! We will be holding a logo contest for guild members to create our new logo. The deadline for submissions is 11:59pm May 31, 2012. 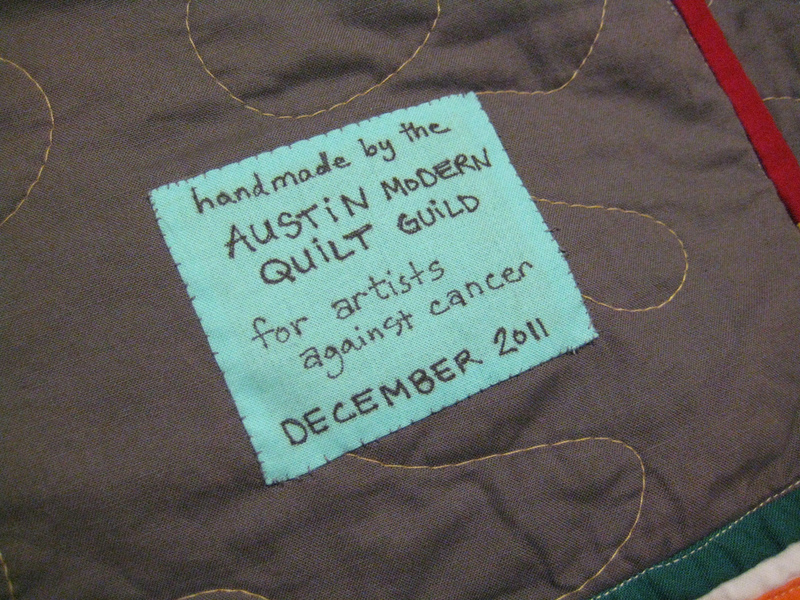 1) The logo submissions should be at least 300 dpi and submitted electronically to webadmin@austinmodernquiltguild.com by 11:59pm on May 31, 2012. 2) The logo must be original artwork. 3) The chosen logo will become the intellectual property of the Austin Modern Quilt Guild. 4) The logo will be used online and in print. 5) The logo will be picked by the planning committee members. 6) The logo can be simply a logo or can include a tagline but does not need to include a tagline. OK, what do you get for a winning logo?!? The winner will be granted free show admission to QuiltCon. Yes, you heard it right! 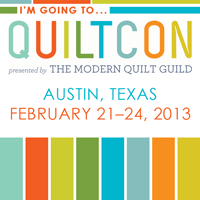 QuiltCon is being held in Austin in February of 2012 and you will get an admission ticket for free! Click here for more details about QuiltCon. Good luck. Can't wait to see all the submission! 8) You may submit more than one logo for consideration. 9) The planning committee will take into account how the logo will print in color as well as black and white. Please take this into consideration when designing the logo. 10) Please do not make your submission(s) public, i.e. post on your blog, facebook page, etc. prior to the reveal of the winning logo. This is the fourth month of our six month block swap. You can read about the details of the swap by clicking on the Block Swap tab at the top of the page. Katie of Swim, Bike, Quilt has written a tutorial for the Six Pointed Star block, you can find it here. 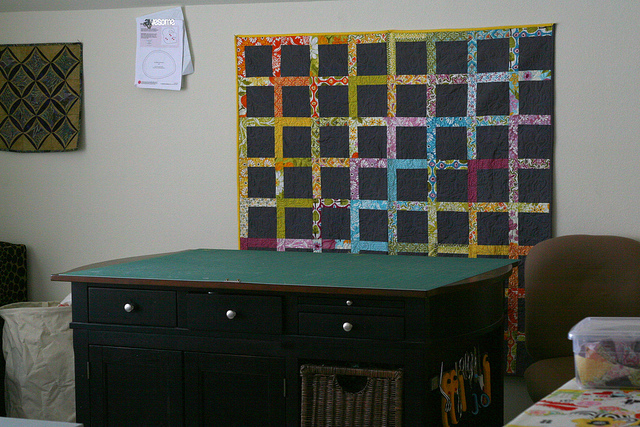 Faith of Fresh Lemons Quilts has written a tutorial for the Lucky Pieces block, you can find it here. All blocks must be 12.5 inches square and made with 100% cotton fabric. You can decide to follow one or both of the tutorials listed above or create your own block. Please make two blocks, one to swap with other guild members at the May meeting, and one to donate toward a future charity quilt. The block that you bring to swap with fellow guild members may be made using any colors you choose. At the April monthly meeting we grouped some of our donation blocks in to three groups so that we can get started sewing them in to quilt tops. We decided to create color palettes for the remaining donation blocks so that we will end up with more cohesive quilt tops. Mostly black and white with a small amount of an accent color of your choice. Orange or yellow, or a combination of the two colors. Also, feel free to make more than one donation block if you would like, donation blocks are always welcome! We look forward to seeing the beautiful blocks that you come up! Heather has been a member of the guild since 2010. She is currently the head of the AMQG planning committee and will also be hosting the Piece-A-Long at this month's meeting. She can be found blogging at fiberosity.com and tweeting at @fiberosity. 1. Tell us a little bit about yourself – where you are from, etc. My name is Heather, my favorite color is blue, I've been married for 19 years and have 3 daughters ages 15, 13 and 10. I'm from Oregon, in a fairly small town about 90 miles south of Portland. Although the location had moved, all my girls were born in the same hospital I was born in. I never planned on leaving that area, I loved the tall trees, cool evenings, rain, mountains, cold sparkling streams and the amazing stuff to do outdoors. Although I didn't realize it at the time, I should have relished the lack of fire ants too. My husband's job moved us here. Its different, but thats not necessarily bad. I like experiencing new things. 2. Tell us about your quilting history – how/when you got started, who introduced you to quilting, what was your first quilt, etc. I've always been fascinated with sewing. I remember my mother sewing at the dining room table when I was very young. One day she got up to stir dinner that was simmering on the stove and I took the opportunity, jumped into the now empty seat, stuck a leather key holder under the needle and pressed the gas pedal. I know I at least broke the needle, perhaps other things, but I remember my mother screaming at me. And being banished to hand sewing for years. When I was about 10, my parents loaned me $25 to buy an old used Singer in a cabinet. I had to repay them by washing cars and doing dishes for a whole summer. But I had my own machine. I wish I still had that machine. I was ummm blessed with a larger than normal bustline and I started making a good portion of my wardrobe by the time I was in high school because nothing fit off the rack. I was doing a full bust adjustment without even knowing what it was. My graduation present was a newer sewing machine. I took a few years off as I got married and did other things in life, but I started sewing again when I couldn't find any cotton nightgowns for my toddler. Then I bought a serger. And kept sewing. My husband upgraded my machine for me when my youngest child was born. It came with a quilting foot.....so of course I needed to take a class. My first quilt was a snowman wallhanging I made in that class. Even though it was a super traditional pattern, I did cut some corners and omit some really fussy parts. The instructor laughed at me because I refused to do the "snowballs" in the corners cause I thought they were ugly. I made my children's entire wardrobes except for socks when they were younger (yes, even underwear and winter coats). As they got older it wasn't as fun and they weren't as excited about it, so I moved to sewing for me and right now quilting is fulfilling that need. 3. What is your favorite thing about quilting? What is your least favorite? My favorite part is buying the fabric and dreaming up the quilt. Oh and binding, I love to sit and hand bind quilts. My least favorite is towards the end of the piecing when I am dying to see how it turns out. 4. Is there a technique on your list to learn this year? I really want to do y-piecing and a hexie project. 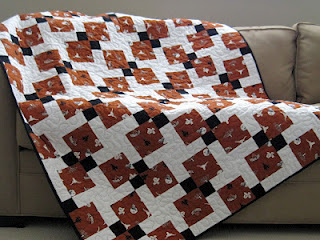 I also want to learn how to better decide what the quilting is going to look like. Its always a stumbling block for me. 5. Do you like to have multiple projects going at once or do you usually finish one before starting another? Definitely multiple. I get bored easily, I get way more done when I switch projects within a day. 6. Do you have a stash? If so, any big plans for it? cough, cough....yes. But some of it is garment fabric. That makes me feel better. My husband can tell you stories about how much of the moving truck was labeled "sewing room" when we moved. It was very scary. I have no plans for it, but I do enjoy petting it. 7. What was the best thing you brought into your sewing room/studio to help you organize it? My husband found a free standing kitchen island in the corner of a furniture store. It wasn't what I was imagining, but it has so much storage that I don't think I could do with out it now. It has large doors that open on both sides to shelves. And on each side drawers and pull out baskets. On one end I have mounted an IKEA magnetic knife bar that holds all my large scissors and rotary cutters. 8. What is your current fabric obsession (color, line, style, etc.)? I have Kate Spain issues. I'm a huge groupie and will buy anything from her. I've also been into orange and blue lately. I just bought a lot of Curious Nature by Parson Gray and I'm loving the hand of the fabric. So beautiful. Oh and I'm building up my solid collection. Okay, I should just say it, I have yet to meet a fabric (produced within the last 5 years) that I couldn't welcome into my stash. I know I have issues. I really do. 9. What tool could you not live without? My beloved Juki sewing machine. My mother bought the Juki rebranded under the Babylock name when I taught classes for a local dealer. She had surgery right after we moved to Austin and I flew back to cook for her and my dad for a week. I sewed on that machine and couldn't get it out of my mind. It only straight stitches, but I was obsessed with having one. I got one last year. Cutting edge rulers are wonderful and I love those. Oh and my seam ripper, unfortunately we have a close relationship. And last, but not least, my sterling silver thimble. I invested in a sized thimble about 10 years ago and it makes hand binding so nice. 10. How many sewing machines do you have? Ummm, I have 13. I currently have 14 in the house so that it's not an unlucky number. Of course I count vintage and sergers in that count, so its not like I have 13 *sewing* machines. 11. 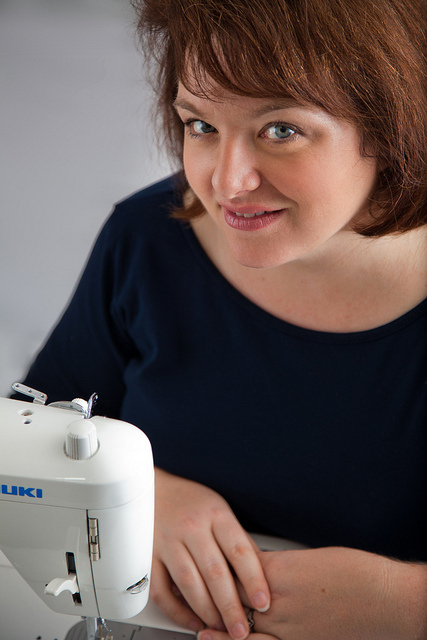 Do you do any other sewing besides quilting? Yep, I garment sew, craft sew, etc. I think if you can name it, I've tried it or bought a pattern or book. I want to produce my own patterns and I'm working on that. Oh and a dream quilt, meaning one that I can envision and hopefully can actually create. 13. What else do you want us to know about you? Hmmm, I love red wine and dark chocolate. "Awesome" is my favorite word, with "seriously" as a close second. If you talk to me for more than a few minutes I will probably say one or both of those. I have Multiple Sclerosis, commonly called MS. I am gluten and sugar free 98% of the time. 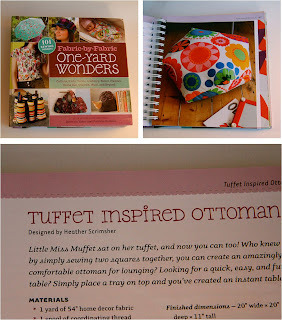 I have a blog, www.fiberosity.com. 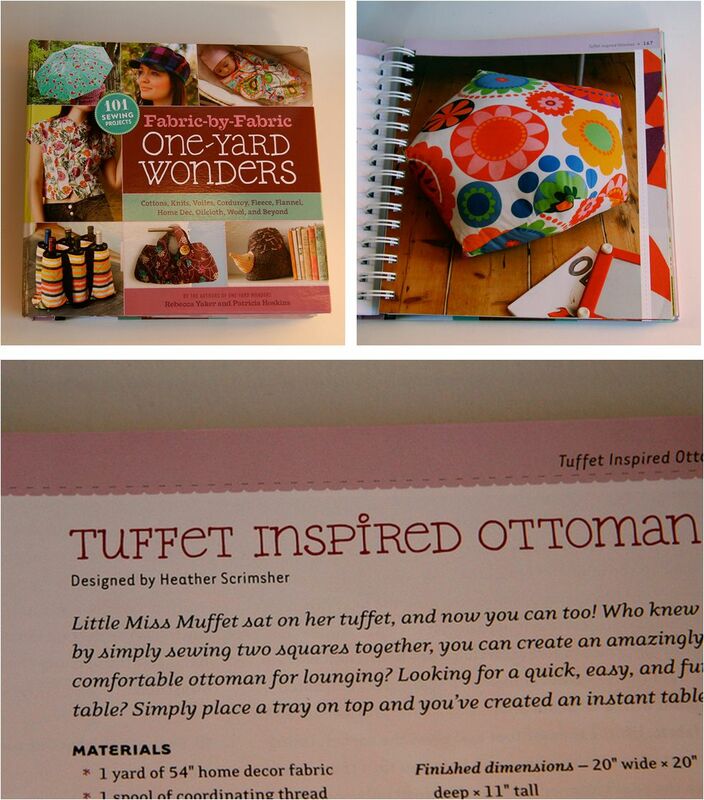 I just had a pattern published in "Fabric by Fabric One Yard Wonders". I'm a very messy sewist and I spread out quickly, don't share a table with me at retreat, really don't. I don't have a day job so you would think that I get tons of sewing done, but there always seems to be something to do for the girls or my husband. Oh and I will have two quilts hanging in Houston at the Modern Quilt Guild Exhibit. I still have to pinch myself whenever I say or type that. When I first joined the Austin Modern Quilt guild in 2011, a charity quilt was in the works. That’s pretty much been the rule ever since – there is always a group project underway that will result in a charity quilt. As I became more familiar with the guild, I participated in the guild’s Ty Pennington Block Challenge, with the two quilts going to families who lost their homes to fire in August 2011. Needless to say, it was a hot, dry summer here in Central Texas in 2011. On Labor Day, a perfect storm of low humidity and high winds hit the region, resulting in large wildfires that burned tens of thousands of acres, destroying over 2,000 homes. The AMQG sprang into action. With donated fabric from several local fabric stores, we held a “mini-retreat” for guild members to come together and work on quilts for wildfire victims. All the quilts were donated to the WildfireQuilt Drive, which collected over 200 quilts from participating guilds. Since then, the guild has donated group projects to Relay for Life and Artists Against Cancer, and another quilt is in the works, culminating from a six month block swap. Special Events Coordinator Jessica Pierre’auguste, who manages group projects, notes that, “We contribute to the community and at the same time guild members with different skill levels learn quilting techniques from each other.” Group charity projects also allow people to contribute who may not have the time to make a full-sized quilt. Individual members have also made contributions. Guildmember Bobbi Brekke has made over five donation quilts this past year. Fiber artist and modern quilter Sue Shore has made over 7 donation quilts. 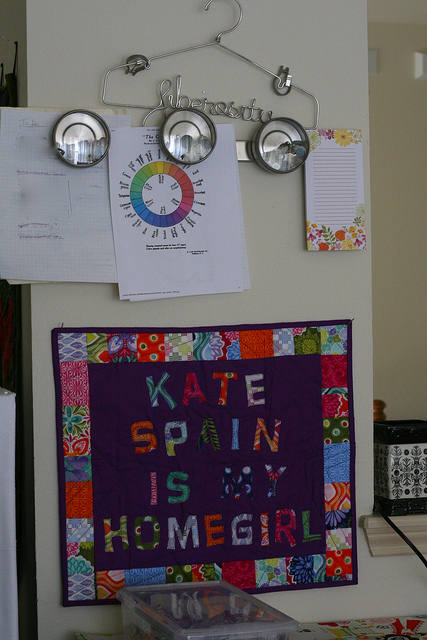 Jessica, who oversees the group projects, also finds time to make donation quilts of her own, which you can see on her Splendid Calm blog. Altogether, our members independently made over 25 quilts to donate to various charities, auctions, and school fundraisers. We’d love to hear about other guilds' charity work. Please share with us in the comments below. Add photos to our flickr group!